“For me, there were so many highlights: the group cohesion, the mix of historical and spiritual perspectives, the great organization of the whole trip, allowing us to see everything that we wanted; all the laughter and playfulness of the group and Patrick. For me, there were two spiritual highlights, one standing on the place where Luther said his first mass. I suddenly had a rush of emotion that my own work has followed in his footsteps. Wow! The other moment for me was to sit in Meister Eckhart’s chair in the church in Erfurt. He was one of my spiritual teachers during a crucial time in my life, through the work of Matthew Fox. Again, a feeling of connect with a mystic from the Middle Ages. Traveling in the 500th year, too, was a highlight. 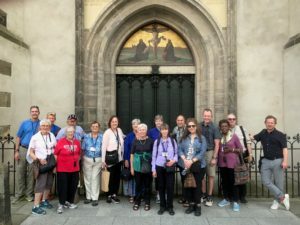 It felt like we were part of a pilgrimage, people streaming to these places from all over the world, all of us walking together in Luther’s footsteps. So many new and deeper insights into this thinking and his life!